You don’t need to buy mistletoe to encourage people at holiday get-togethers to kiss. Instead, substitute this “holiday kissing ball” from Ocean Spray. First head to the crafts store, then pick up fresh whole cranberries. You can pick up an extra bag or two for a Valentine Kissing Ball (and if you prefer, a foam heart instead of a ball). A kissing ball, mistletoe optional. Photo courtesy Ocean Spray. 1. PAINT the foam ball with red craft paint. Set aside to dry. 2. CUT an 18″ piece of wire and fold it in half. Push the folded wire all the way through the center of the ball, leaving a 1″ wire loop extending at bottom of ball and 3″ of wire extending at top. 3. 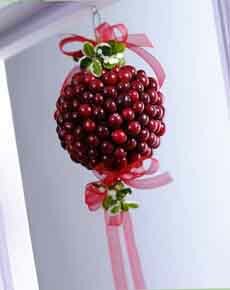 ATTACH the cranberries to ball with a hot glue gun or toothpicks, covering the ball completely. Spray with shellac for longevity (otherwise, the berries soften after 5 days or so, and the appearance will diminish). NOTE: The glue gun is a better choice. If you don’t have one, you can pick one up when you buy the foam ball at the crafts store. 4. TWIST the two wires at top of ball into a simple hook for hanging. Use ribbon to tie the desired holiday trim to wire above and below ball, and hang with a hook. 5. FIND someone to kiss and guide him/her underneath the ball.